Apartments range in size from 263 ft. to 1113 ft. The layout and flow of our building and common areas are thoughtfully arranged to accommodate all of our residents daily needs and the diverse activities such as dances, special events and speakers that we host. Above the first floor are a variety of apartment floor plans. We have one bedroom with den, studio, one and two bedroom models and they all have exceptional features. 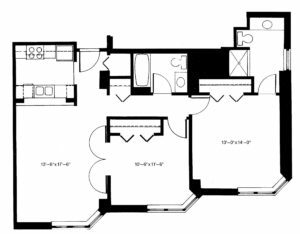 Apartments range from 263 feet to 1113 feet and we even have Penthouse models available on the top floor. Each floor features a series of apartment models. From the Alcove, Belmont, Tanforan, Hialeah, Centennial, Centennial Deluxe, Saratoga, Lexington-Canterbury and Arlington, each apartment model has it own set of unique and appealing characteristics. Some models are sunny one bedrooms with spectacular views of the Denver skyline, Front Range or the meandering Platte River while other 2 bedroom models feature choices such as walk-in showers, walk-in closets or the popular den that opens into the living room. 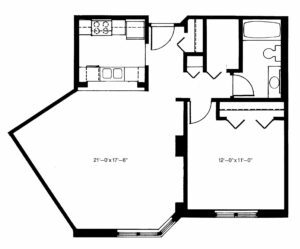 All of our apartments offer creative floor plans certain to make your apartment a home to enjoy. RiverPointe features Penthouse models on the top floor. These models are one-of-a-kind apartments that provide spacious and unique floor plans along with breath-taking views. 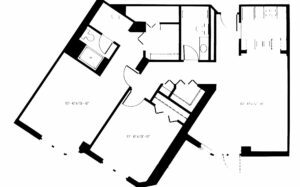 Square footage range from 980 to 1025 square feet. Models range from one bedroom plus den with 1 and 3/4 bath to two bedrooms with 1 and 3/4 bath. We suggest that you tour our building and if you feel RiverPointe is a good match for your needs and lifestyle we encourage you to apply early.